Darpa (Defense Advanced Research Projects Agency) has awarded prime contracts to all four participating companies to begin Phase 1 development for the agency’s VTOL X-Plane program. Boeing and Karem Aircraft received contracts this week; Aurora Flight Sciences and Sikorsky had previously received prime contract awards. While all four have submitted proposals for unmanned vehicles, the technology that is to be developed has equal application to manned VTOL aircraft. The VTOL X-Plane program is being undertaken to provide a step-change in the performance and capability of rotary-wing/VTOL aircraft. Acknowledging the great versatility and usefulness of the helicopter, Darpa has nevertheless identified its principal weakness: the inability to fly at speeds much faster than the 150- to 170-knot regime. Although experimental designs such as the Sikorsky X2 and Airbus Helicopters X3 have shown rotary-wing aircraft can reach 250 knots, such speeds have been accomplished with considerable compromises made to range, efficiency, useful payload and simplicity of design, according to Darpa, which is looking for vehicles capable of 300 to 400 knots. Three of the companies have issued artist’s impressions of their concepts. Sikorsky has teamed with the Lockheed Martin Skunk Works to offer a tail-sitting design that draws on the Skunk Works Rotor Blown Wing technology, and was awarded its Phase 1 contract in December. Aurora Flight Sciences was awarded a Phase 1 contract in February for its LightningStrike concept, which integrates the propulsion system into the air vehicle’s aerodynamic design. Boeing’s concept, dubbed Phantom Swift, employs a wide, blended body incorporating two large lifting fans, which are covered in forward flight. It has ducted fans in swiveling nacelles at the end of the short wings. 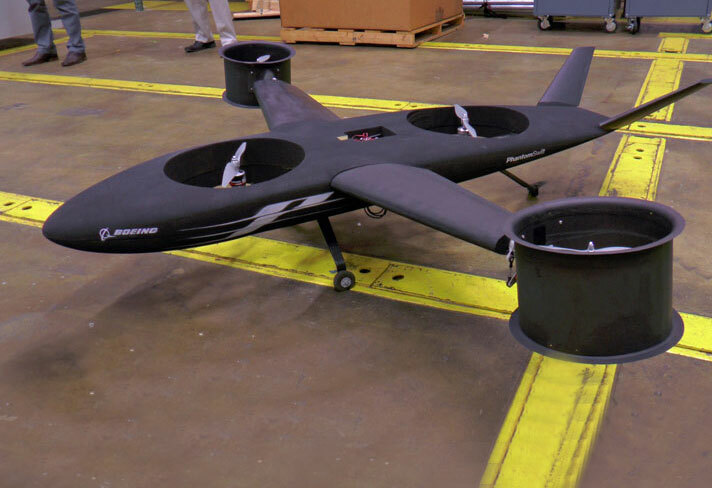 Boeing has already built and flown a scaled-down model of the Phantom Swift. Karem Aircraft’s tilt-rotor concept employs a slender-bodied fuselage with a high-aspect-ratio gull wing. The outer sections of the wing, together with the two large rotor/propellers, rotate through 90 degrees. A common feature of all designs is the employment of multi-purpose technology that uses individual systems to perform several tasks, thereby reducing weight and complexity. The four companies are expected to submit their detailed preliminary designs by late next year. At that time Darpa aims to select one design and issue a contract to build a technology demonstrator to fly in 2017/18.